There is a mountain called Hakone which is covered in thick woods …. Along the dark trail uraha gusa grew from the stones to light our way. These words might well have been written by a modern traveller enchanted with the luminous quality of what is more commonly known as Japanese Forest grass or Hakonechloa macra. In fact, they come from a fascinating memoir “The Sarashina Diary A Woman’s Life in Eleventh-Century Japan” translated by Sonja Arntzen and Moriyuki Ito (Columbia University Press, 2014). They also point to the conditions in which hakonechloa thrives, although a thousand years later gardeners have several more cultivars to choose from than would naturally have occurred in medieval Japan. I first fell under the spell cast by gorgeous images of hakonechloa long before I encountered it in person, a bit closer to home, in 2008 in Knoll Gardens. The sight of hakonechloa macra planted as a luxuriantly textured ground cover surrounding an ornamental tree had me hooked, inevitably I came away with a dozen 9cm pots, regardless of where I was going to put them. After a couple of years in a nursery bed, they were planted out to edge a flight of concrete steps to the yard. Although plain leaved forms are the most vigorous, they’re not in a hurry. Plants generally “sleep, creep, leap” over 3 years, but allowances must be made for this grass, it likes an extra year to sit and think about it. Patience is rewarded : the steps are dramatically softened from springtime onwards. Hakonechloa relishes the same sort of conditions as the variegated hostas, fertile, moisture retentive soil but with the added bonus that once the hosta leaves are looking past their best the grass hides the late summer snail damage. Cooler weather suits it too, making it a very useful plant for UK gardens. Then in winter, the dried leaves add interest to what would otherwise be bare ground. I just love everything about Hakonechloa macra ‘Aureola’. 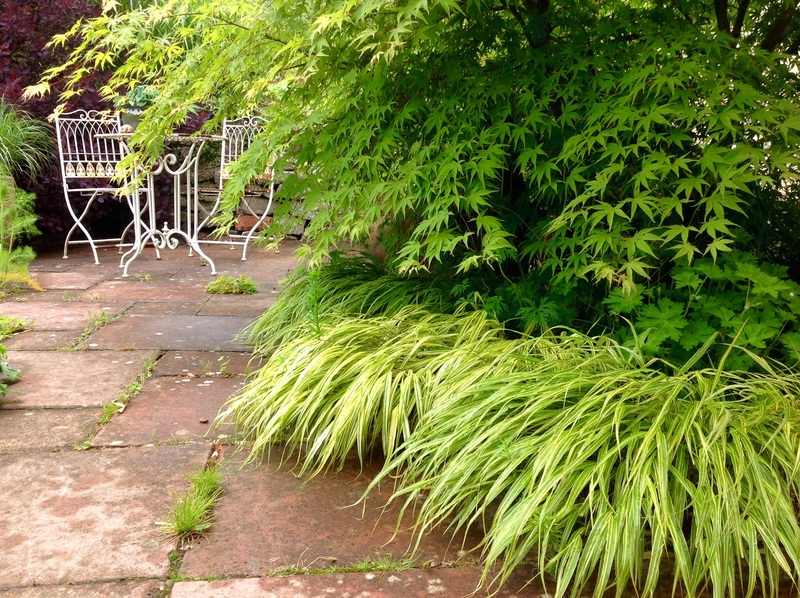 I’m told that Hakonechloa macra ‘Alboaurea’ is just as good, if not better, and, I’m sure that may be so. But this is the cultivar I bumped into in 2010 and, as soon as I spotted them I knew it was my lucky day : as good sized 2 litre plants they had already passed the ‘sitting’ stage. Here they alternately punctuate a narrow path, to deliberately slow progress between the busy front and quieter back garden. The beauty of any hakonechloa is that it drapes a surface with such grace, it can be brushed past with impunity. Even on a wet day there are no damp leaves languishing on the paving to worry about. Wading through the knee high mature clumps produces a very satisfying swish. The bamboo-like leaves are cool to the touch even on the hottest day. 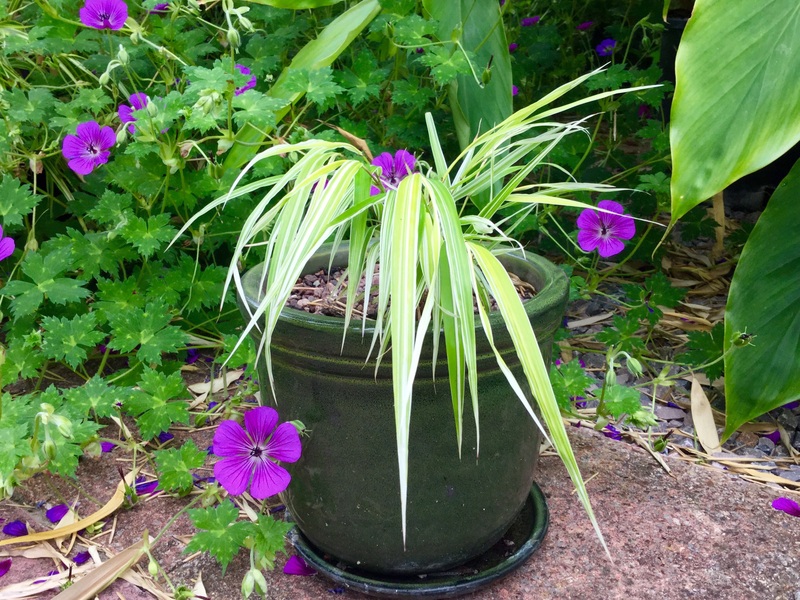 My plan was to grow a couple in large pots (inspired by images of Adrian Bloom’s legendary variegated specimen that used to enjoy an annual outing to The Chelsea Flower Show.) However, the paler leaves appreciate more shade than I’d bargained for and first bleached, then scorched, then were hastily moved. For the first two years they were kept well watered, since then apart from a springtime mulch they’ve been happy to fend for themselves. Unlike many ornamental grasses, hakonechloa seems happy in the lee of other plants, in my garden it grows well beneath the lonicera hedge and curtsying to one side of the taller Pennisetum alopecuroides ‘Black Beauty’. 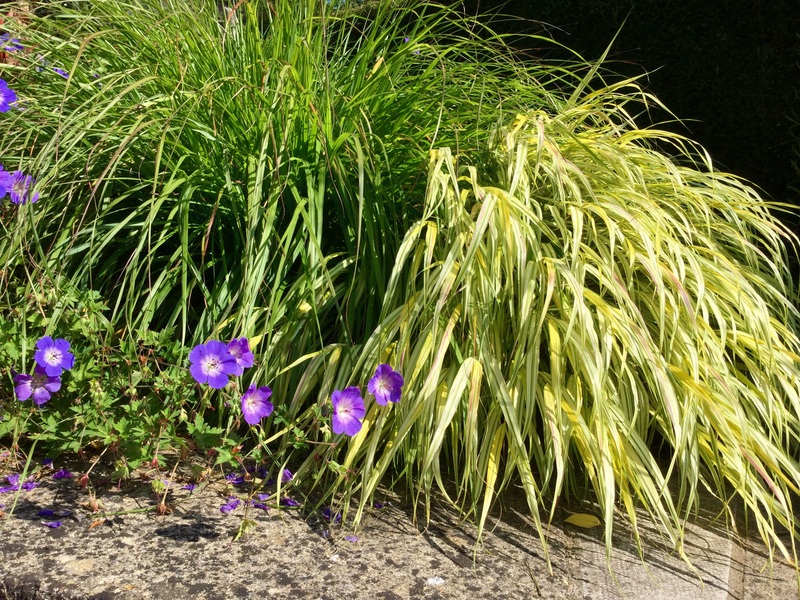 Hakonechloa macra ‘Aureola’ in autumn sunshine. And one of the same plants the day it was cut down in February. 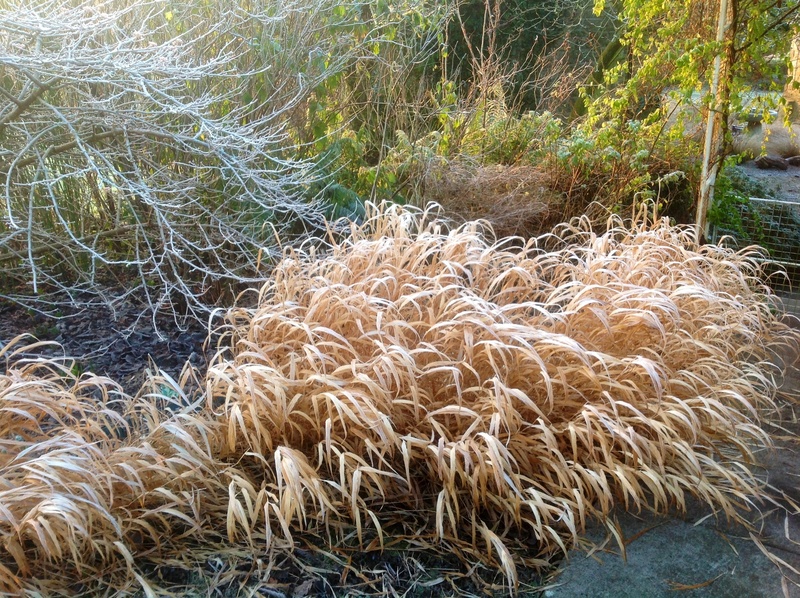 Of all the hakonechloa I enjoy growing, this is also the one that packs the biggest punch in the autumn and winter. Autumn sunshine sets the leaves smouldering, but it’s the low angled winter sun fortuitously striking the path that ignites the blaze. 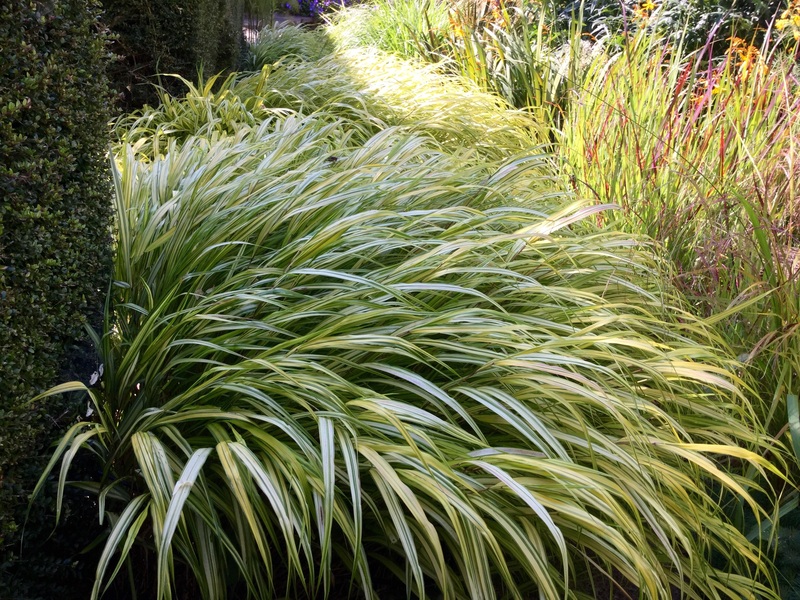 Hakonechloa ‘Albostriata’ is a boldly striped variety, arguably more yellow-green with the merest white splashes (but I find missing the pink tinge ‘Aureola’ assumes as the season turns to autumn). Perhaps it’s hard to be precise about the tonal characteristics of variegated hakonechloa unless the cultivars are grown in controlled conditions? 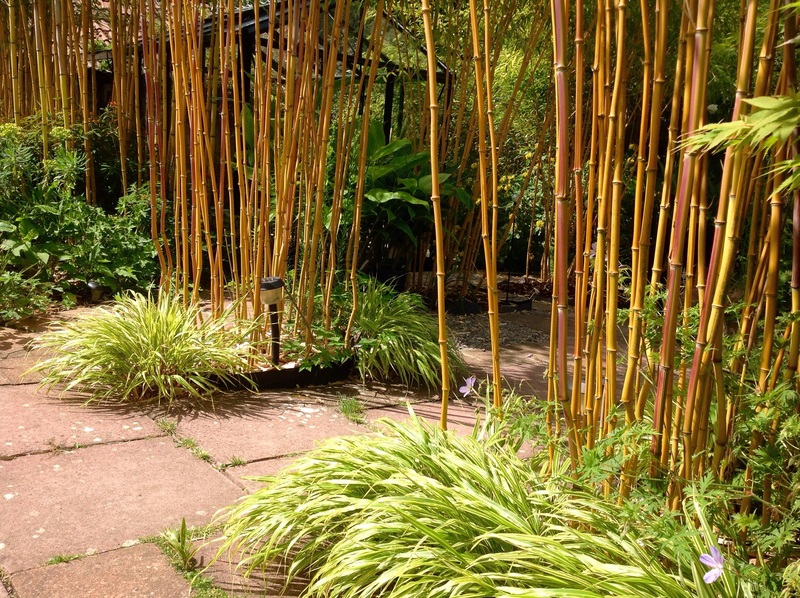 This cultivar copes with more direct sun, as under the stripped stems of the Phyllostchys aureosulcata spectabalis, plus it conveniently conceals the protruding lip of membrane controlling the bamboo’s root run. Planted into the sandy foundations of the patio, this is a tough place for plants to establish, they’ve done well. Given the sunnier site these clumps are already producing inconspicuous burgundy coloured inflorescences, they’re discretely tucked among the leaves but worth seeking out if you like the fine detail of plants. ‘Albostriata’ is a shorter cultivar than the previous two, at about 12″ in this spot, possibly the dry, sunny conditions keeps it lean. 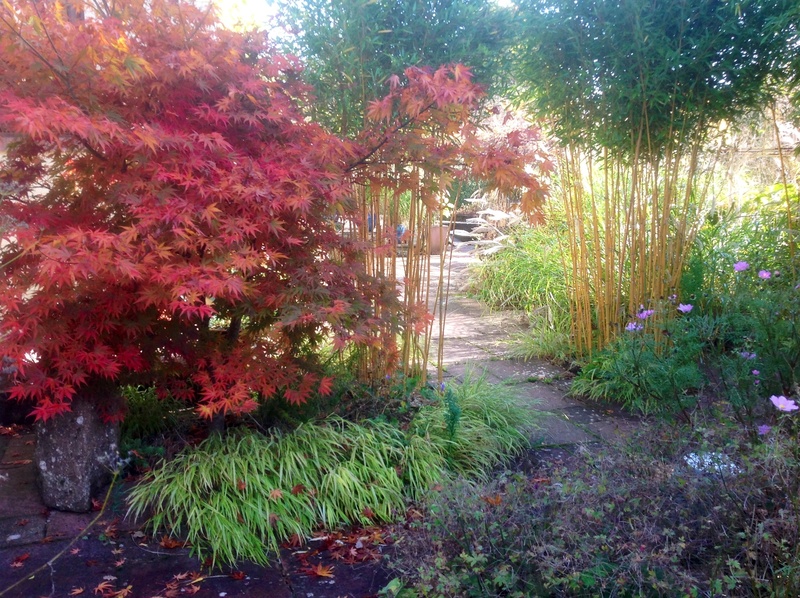 As you’d expect, Japanese Forest Grass compliments acers, I particularly like the combination in the autumn. Hakonechloa macra ‘Stripe it Rich’ is one of the latest modern cultivars growing on in splendid isolation in a pot until it can hold its own in the ground. Right now, Geranium Sirak would swamp it! Hakonechloa macra is unusual in that it’s monotypic – a genus that has only one species. It’s also from a specific habitat, therefore new cultivars have both immense interest and value. Unsurprisingly, specialist nurseries covet discoveries such as this white and gold variegation of ‘All Gold’ and, accordingly, win well-deserved Plant Breeders Rights. A dwarf form at 6″ in height, the form of Urahagusa in the image above wouldn’t have been around to guide Sarashina through those shady woods, but ‘Stripe it Rich’ is just the sort of gem to light up the eyes of a modern day collector. 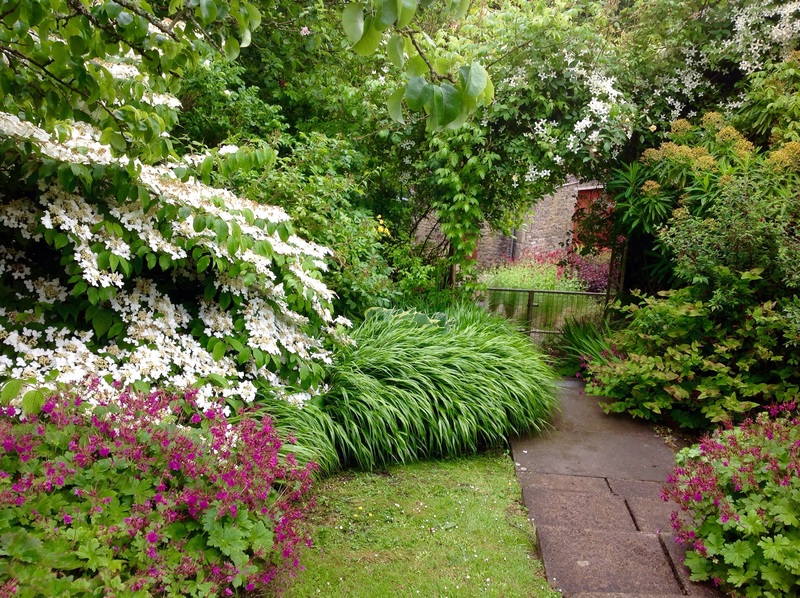 They all look beautiful in your setting, they certainly soften the edges of paths and steps. I have a couple of varieties but can see me buying more now! That’s kind of you to say so, but I think they are simply beautiful plants, glad to hear you grow some too. I instantly wanted all or any of these in my garden. Thanks for the very useful and illustrated information. That’s nice, I do hope you try one or two and enjoy them as much as I do, they’re gorgeous! What a descriptive and informative blog post Kate. I only grow a few grasses and I’ve never tried any of the Hackonechloa.i think that’s about to change! Well that’s good, it’s a very well behaved one to try and you sound like a patient person! A great post. These are gorgeous grasses of course, but the way you use them is fantastic. I always enjoy glimpses of your garden. Nobody does grasses better than you do. Thank you, what a lovely compliment. 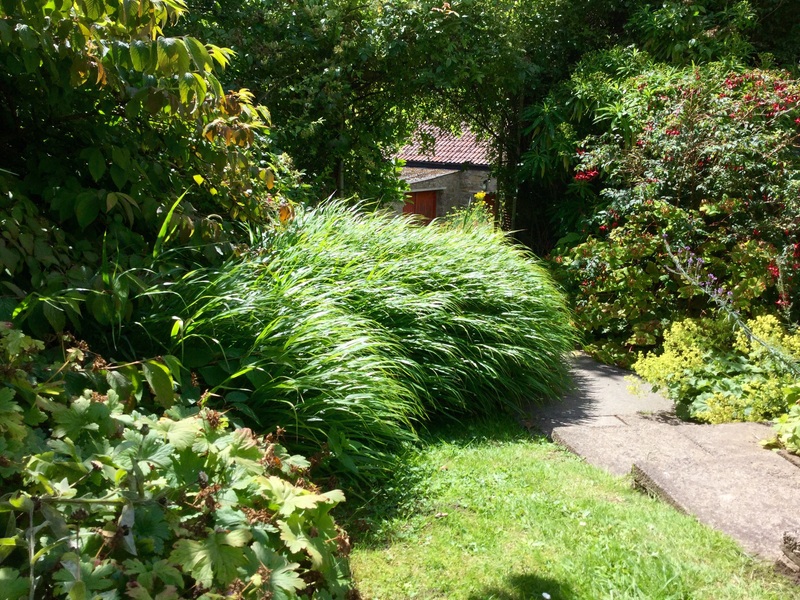 It’s nice to share my experience of growing grasses, this is one of my favourites – I’m pleased you like it too. You have placed all your grasses beautifully showing them to advantage. I’ve always admired this grass but never seen it planted as well. I do appreciate your comment, thank you. I’m a hoarder of inspiring images of how plants can be used, it’s great when something works out well in my own garden. You’re welcome Annette, I’m not sure exactly where you are on the continent but you’re right to be cautious of you have extended hot, dry summers and would find it hard to provide shade …. I think the plain leaved forms are the most robust. I’m in south-west France, Kate, very challenging summers at times. Wow! Spoilt for choice as I love them all! I love the wave like effect they have when grouped together. I have just bought my first three Macra, and they are doing … nothing! Just sitting and sulking, but you have given me new hope as they obviously like to sit and think for a very long time before they actually DO anything! Yours all look fantastic. 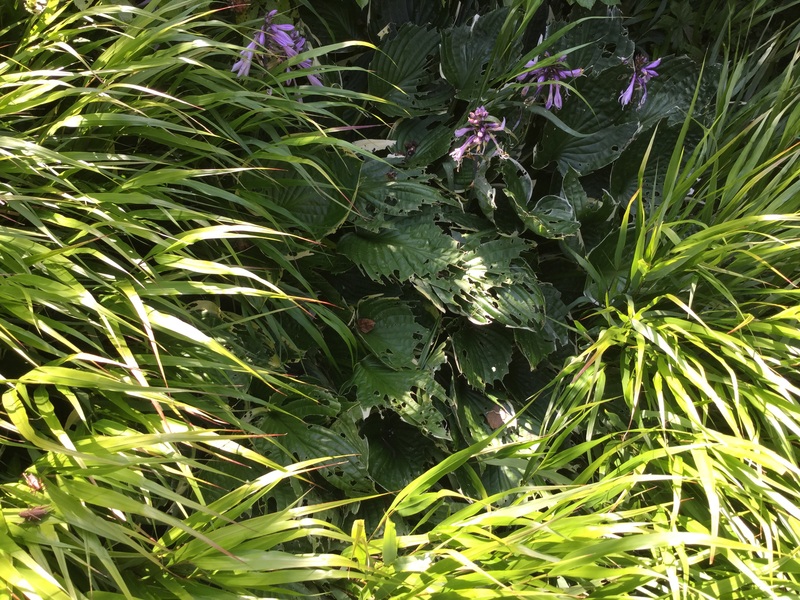 I use hakonechloa to edge my woodland garden. I like the way it hides dying foliage of Spring bulbs and gives an air of mystery to the border in summer and autumn. Like you I bought small pots quite cheaply, in my case back in 2006 and I do remember it took a few years for them to fill out. I hadn’t thought to use them to soften steps and other hard surfaces, what a good idea. Apologies for getting here so late.. catching up. 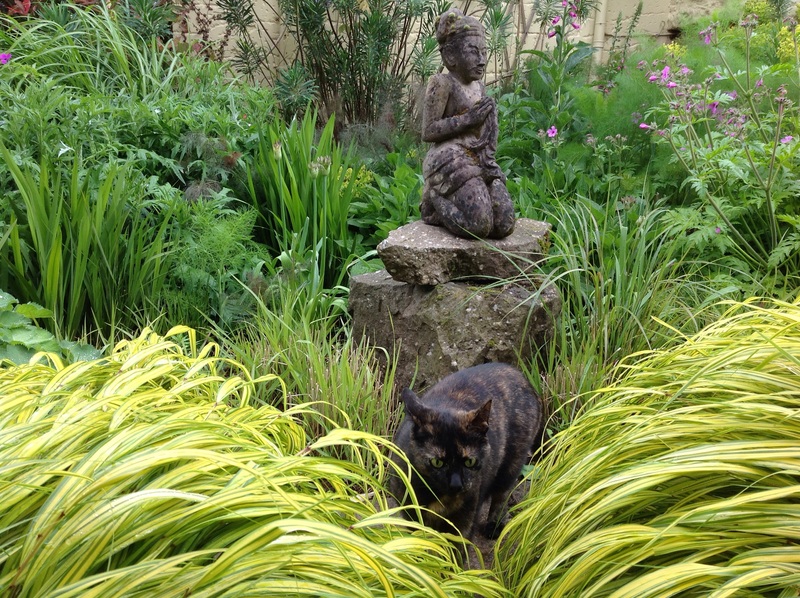 This is one of my favourite grasses. I have ‘Aureola’ that I started from one small pot. It’s taken years, moved with me twice and now forms half a dozen large clumps. It does take a while to settle after being divided but worth the wait. The autumn tints are just beautiful, just starting here now. Lovely to hear from you, Jessica and very kind of you to find time with all the internet trouble you’re having. ‘Aureola’ looks stunning on your terraces, great to know a mature clump divided so generously – I may give it a go myself.